Dazzle and Sizzle: **CLOSED ** INTERNATIONAL GIVEAWAY-GIFT VOUCHER WORTH US$40 ! 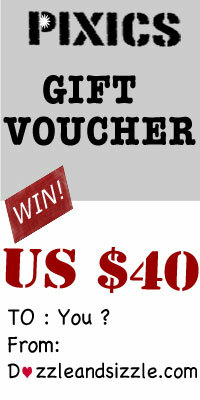 **CLOSED ** INTERNATIONAL GIVEAWAY-GIFT VOUCHER WORTH US$40 ! Finally ,I am doing my first giveway and I am super excited about it. 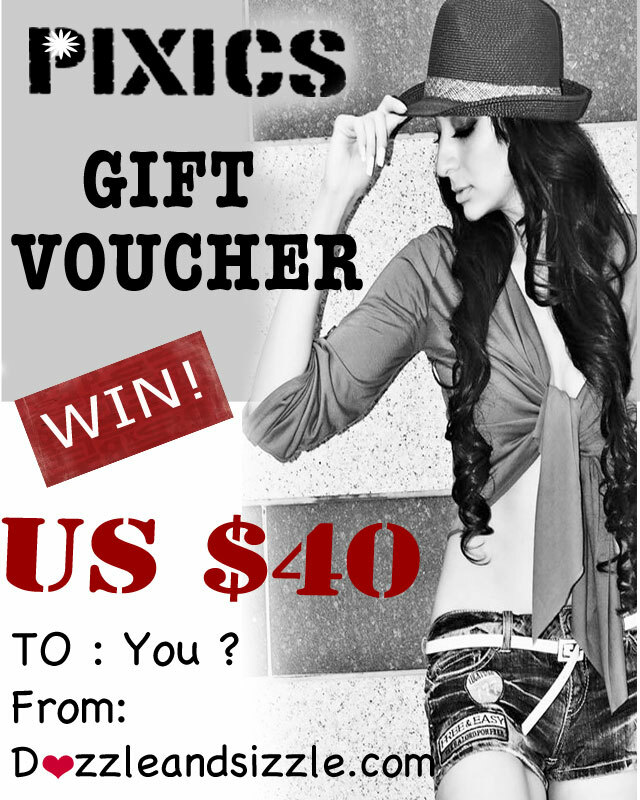 The winner gets a US $40 gift voucher to shop for anything from Pixics.com. Some of my favorite outfits from Pixics are below. The giveaway is open worldwide and will end on August 31st'2011 . The winner will be picked via www.random.org . The gift voucher also includes the shipping costs. THANKS AND ALL THE BEST!!! Yayyyy...Im already following you and like u on fb too !!! Love ur blog girl!Hope for the best! I follow you through GFC & also like yr FB page.. I've set my eyes on the Bear Ear Hoodie Coat, the brown color is fabulous! Like on FB (jc loh), thanks for the lovely giveaway. and congrats on the giveaway! There are some great fashions at Pixics. I'd love a chance to win. I like you on FB (Suzanne G). I "like" you on Favebook - Cindy A.
I have liked you on facebook and I'm also your follower ! The giveaway button is on my sidebar! The giveaway buttom is on my sidebar! 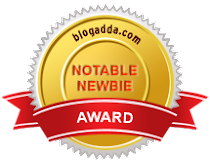 Following you with GFC - ArtsyChaos. i liked you on facebook as Eva J.
Oh, and I liked your Facebook page too. i 'like' you on FB: colleen b.
wow !! Lovely giveaway !!! I liked you on Facebook as "Young Trendsette"
I shared your link my face,twitter and blogspot. I'm now a GFC follower! also liking you on FB! Thank you! Hi! I'm a new follower :). I follow you via fb as Dorottya Zsófia Bacsi. I am your new follower as Marina D.
And I also liked you on facebook as Marina M.B. I'm GFC follower as Ana D.
And i like you on facebook as Ana D.. I follow your blog publicly via Google Friend Connect as shala_darkstone. Thanks so much for the giveaway! The shopping season is definitely picking up. Black Friday and Cyber Monday may be over but people are still rushing everywhere to buy gifts and get voucher codes UK for the holidays.